The color of the font will change, for example as I type this, it went from black to white. Or as I scroll a webpage, in the terminal, update window etc. Highlighting the text if it can be selected, tends to bring it back. Here are the SystemD logs logs.tar. My gpu is nvidia 750Ti. I tried to install some other fonts, not sure how well it worked. Had errors about installing 32bit libraries on a 64bit system, even though I commented out the multilib part of the conf file. Windows fonts showed conflict errors with other fonts, which I didn’t know how to fix. Does the issue occur when using the Numix Frost themes (Gtk, Window, and Cinnamon)? Both default Cinnamon and default Gnome3 installed. And it happens in both. According to themes Numix Frost is used for window borders, controls, and desktop. Does that answer all the questions you asked. If not can you give me a hint for where else to look? Are you using the default nouveau driver? Then this is the problem. Try installing the proprietary nVidia driver. The package is just called “nvidia”. Thanks the rendering is fixed. I presume the opencl are the non-proprietary drivers. So all the nvidia packages from extra are made by nvidia. Is it safe to remove all the community ones. Is bumblebee worth installing. If this is a question, then this article could help you to make a decision. When I did an update, I got this warning, can someone explain what it means. After close is pressed the update install continues. Is that the right approach? This is the testing lines in the conf file? I installed and ran the refelector package, Hopefully I wont get that warning again. I forgot to add that the opencl stuff has nothing to do with the non-proprietary drivers. OpenCL is a set of libraries / API for doing GPU computing. @pgoetz Thanks for your help. So the openCL packages are for making games, boinc (distributed computing) etc? Just wondering if they should be removed. The warnings are still popping up when during an update. There was a dialog box which came up about resetting the mirrorlist. Ran the command again. Would it help to post the pacman.conf. GPU computing is for distributed and/or high speed floating point operations (i.e. math, scientific computing). If you’re not doing this stuff, you can safely remove the opencl packages. In fact, I’m not sure how/why these got installed on your system in the first place. Nothing seems to depend on them. 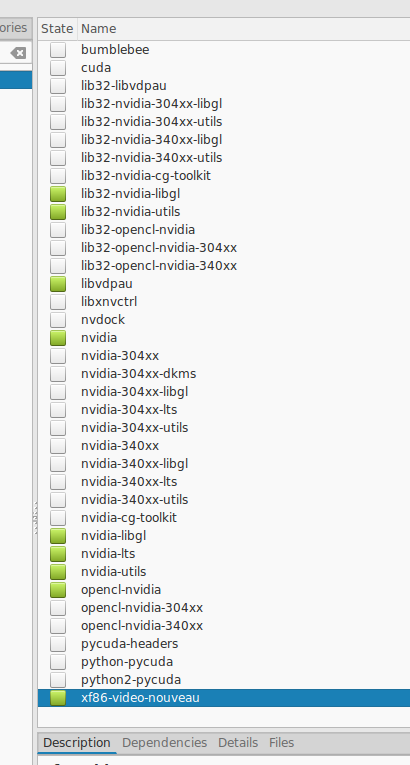 Removed nvidia-Its and opencl-nvidia since they weren’t dependencies for other programs. I installed some random packages as my first attempts to solve the original font issue.